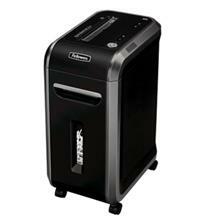 The Fellowes Powershred 90S Strip-Cut Shredder is intended for heavy office use. It will shred up to 18 sheets of 70gsm paper at a time into strips measuring 5.8mm wide. The shredder has a P-2 security level rating, so is suitable for everyday (rather than more confidential) shredding requirements. The Fellowes 90S can shred for up to 25 minutes non-stop before it triggers a 40-minute cool down period. This allows it to be used by multiple office users, with Fellowes recommending between 3-5 people. As well as paper, the shredder will get through staples and small paperclips, saving you the time of having to remove these prior to shredding. It will also shred both credit cards and CDs, ideal if you need to safely dispose of this kind of material. The large 34 litre bin is a pull-out style for easy emptying and also features a see-through window so you can see if it’s getting full. Other features include: a 230mm throat width (for A4 shredding); SilentShred technology which minimises noise disruption in the office; castors for easy manoeuvrability; LED indicators which show overheat, bin open, bin full and remove paper warnings; and a reverse option to help clear any paper jams. So, if you’re looking for a high capacity strip-cut shredder with large bin for your office, then consider the Fellowes Powershred 90S Strip-Cut Shredder. For your peace of mind the shredder also comes with a 2 year machine warranty and 5 year cutting blade warranty.